The Valley of the Kings is a valley in Egypt where, for a period of 500 years, tombs were constructed for the Pharaohs and nobles of the 18th to the 20th dynasties. Known as ‘The Great and Majestic Necropolis of Millions of Years’, it is one of the most important archaeological sites in the world. Let’s Go gives you an overview of this colossal legacy. The valley stands on the west bank of the River Nile, opposite Thebes (modern Luxor), and is honeycombed with tombs. The hills on the west bank of Thebes protected the site from the flooding off the Nile and formed a natural pyramid overlooking the valley. In 1979, it became a World Heritage Site, along with the rest of the Theban Necropolis. Egypt has had a turbulent history. The Old Kingdom (3rd to the 6th dynasty) ruled from 2649–2150 BC. This period is referred to as “the Age of the Pyramids”, as the kings built pyramids for their tombs. During the rule of the 13th dynasty there was a period of disunity and cultural decline which enabled Hyksos, who were basically Semitic, to wrestle control of northern Egypt in 1720 BC. Eventually the 17th dynasty in the south in Thebes challenged the rule of Hyksos and declared its independence. With the 18th dynasty, the New Kingdom began. The New Kingdom of Egypt is the period between the 16th and the 11th century BC, covering the 18th, 19th and 20th dynasties of Egypt. It was Egypt’s most prosperous time. During this period, the valley in the south became a royal burial ground for pharaohs beginning with Thutmose I and ending with Ramesses XI. Unlike the Pyramids of yesteryears the tombs of the New Kingdom adopted a very different approach. They built deep underground tombs so as to conceal the burial place from robbers. The plan consisted of a long inclined rock-cut corridor descending through one or more halls to the burial chamber. The New Kingdom saw the most glorious tombs which had the king’s formal names and titles along with his images and statues inscribed on it. These tombs were decorated with scenes of the journey that the king would take as they moved from this life to the afterlife. The scenes were very colourful and drawn from vignettes from the Book of the Dead, the Book of the Gates and the Book of the Underworld. The ceilings of the burial chambers were decorated with pictures from the Book of the Heavens. Each tomb was provided with magical items, divine figurines and equipment that would enable a comfortable existence in the afterlife. The Valley of the Kings has seen major Egyptological exploration for the last two centuries. The discovery by Howard Carter in 1922 of the almost undisturbed tomb of Tutankhamun revealed the riches of the royal burials. The coffin itself was made of 110 kilograms of gold. Modern excavators numbered the tombs as ‘KV’ or ‘WV’ standing for ‘Kings Valley’ and ‘West Valley’. Since the mid-1990s considerable attention has been given to KV5, the extensive tomb of the sons of Ramesses II, consisting of about 120 rooms. With the discovery of a new chamber in 2006 and the discovery of two tomb entrances in 2008, the valley is known to contain 63 tombs and chambers. Despite the exploration and investigation, only eleven of the tombs have actually been completely recorded. The tomb of Ramesses III is the grandest tomb in the valley. The walls of the tomb are inscribed with scenes from the Book of the Gates and book of Amduat. It is located close to the central ‘rest–area’ and is most visited by tourists. The tomb of Ramesses IV, which has been open since antiquity, contains a large amount of hieratic graffiti. Though small and unimpressive, Tutankhamun’s Tomb is probably the most famous. It appears that the tomb was hastily prepared as Tutankhamun died at the age of 19 years. Ramesses VI had one of the largest tombs in the valley. His tomb is decorated with scenes from the book of the underworld, and the burial chamber is dominated by the shattered remains of the king’s massive granite sarcophagus. The tomb of Seti I is the largest and most elaborate of the royal tombs. The powerful kings of the 18th and 19th dynasties kept the tombs under close supervision, but under the weaker rulers of the 20th dynasty the tombs were looted often by the very workers or officials responsible for their protection. In order to prevent further thefts, the mummies and some of their funerary objects were reburied in two secret caches, not to be re-discovered until the 19th century. 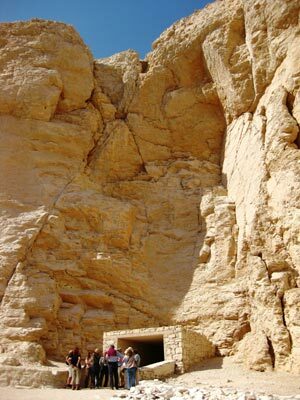 Visitors flock the Valley of the Kings to view the fascinating tombs. Be a part of this grand narration and see for yourself the grandeur of the Pharoahs as they voyage their afterlife to meet the gods and achieve immortality.